Jordan of the Islands most pungent Blueberry has been bred with a fine upstanding, hard hitting, Purple Kush. Jordan's PK pheno is sure to please, it dominates this strains characteristics. Savoury and dank with a little Blueberry sweetness and density. Two of the most sought after varieties have finally come together for the perfect blend of connoisseur and commercial strains. We recommend Deep Purple for people who love the best kush. 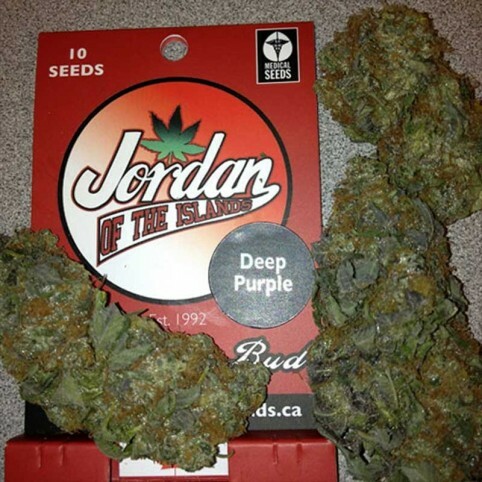 These marijuana seeds grows between 4 - 5 feet and is very bushy plant with light green and plenty of purple coloring. Experienced growers can produce between 4-6 ounces in 50 - 60 days of flowering - making this one heavy producing plant. People seeking fruit kush flavors need to seek out Deep Purple. A mixture legendary Kashmiri / Bubble Candy. Midnight Mass is the call for all who love the grass. T..
Heavyweight Seeds has crossed a Lemon Skunk with a powerful dangerously Cheese, which has resulted i..
Bad Azz Kush cannabis seeds have been bred using a true Indica that has a rich history dating back t..